Something to think about in order to be different: Broadband Speed Tiers: Should You Eliminate Them as a Usage Based Billing Strategy? The suggestion is as follows: "Instead of emphasizing speed, why not emphasize a better broadband experience that delivers all the applications customers want, and base their monthly billing on their amount of broadband usage. It’s a bit of a paradigm shift that’s broader than just about shifting to a usage based billing strategy." On the other hand, C-Link presented data that showed Gigabit announcements helped to sell mid-level speed tiers. 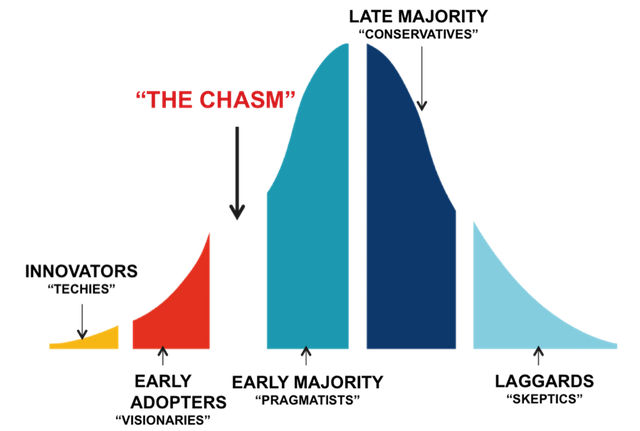 We have a chasm problem in both broadband in general (called the Digital Divide) and with FTTH specifically. It is hard to get past the early adopters (unless you have a monopoly), because people are used to DSL or Dial-up or using mobile data. Education and training are required to explain what can be done with Gigabit broadband beyond Netflix and other TV options. Tele-medicine, job opportunities, online learning, homework, side gigs (Etsy, eBay) and so much more. Fixed Wireless is being used because Type II is expensive; and pole attachment is challenging. Fixed Wireless isn't reliant on those issues.